Those with an interest in comic strip history should of course be familar with the adventures of Ignatz Mouse and Krazy Kat, written and illustrated by George Herriman in the early 20th century. 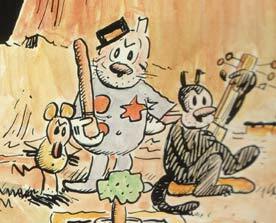 Now Sunday Press Books brings us Krazy Kat: A Celebration of Sundays, coming this June in Hardcover. Collecting the greatest Krazy Kat Sunday pages, for the first time in their original size and colors, just in time for Krazy Kat’s 100th birthday. The book also includes a sampling of Herriman’s pre-Krazy works, as well as contributions by Michael Tisserand (Gambit Weekly) and Art Spiegelman (Maus). Here’s more information on the book at Westfield Comics.